GCA Altium acted as exclusive financial advisor to the shareholders of Wex Photographic on its sale to AURELIUS. Following the deal, Wex will be merged with Calumet to create Europe’s leading omni-channel retailer serving the enthusiast and professional photographer. Wex Photographic, established in 1997, is the UK’s leading online photo retailer, focused on meeting the needs of enthusiast and pro photographers and videographers. Wex’s dedication to service, expertise and customer satisfaction is underpinned by competitive prices and the largest range of any UK photo and video retailer, with over 17,000 products. The multi-award winning Wexphotographic.com website is complemented by a highly knowledgeable customer contact team, its Norwich showroom, and extensive online content. Wex was voted ‘Online Shop of the Year’ by Which? readers in 2014, shortlisted for ‘Retailer of the Year’ by Which? in 2015, and certified as one of only three Recommended Providers in its ‘Electrical Online Retailer’ category in 2016. 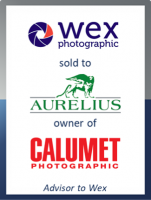 Following the deal, Wex will be merged with Calumet, a multi-channel photographic retailer acquired by AURELIUS in June 2016, to create a European market leader serving enthusiast and professional photographers. The combined business will generate revenues of over €175 million. David Garratt, CEO of Wex, said: “This was a hugely important transaction for Wex and its investor, Barclays. The GCA Altium team invested time understanding what made the business tick, advised us on strategic choices before the sale process was initiated and then worked tirelessly to deliver the optimal solution for all stakeholders. The Wex team now look forward to taking the business to the next level with the support of our new backers at Aurelius." The transaction represents GCA Altium’s 16th e-commerce transaction in the last two years, reinforcing our position as one of Europe’s pre-eminent advisors in the sector.